M might stand for More, More, More… With nothing short of astounding acceleration, the brand new 2018 BMW M5 has arrived! 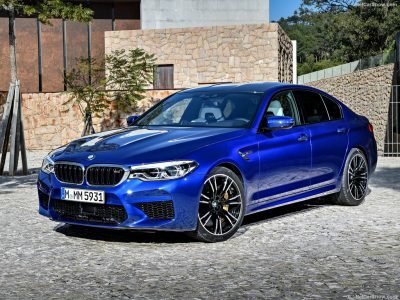 The latest BMW M5 now becomes the quickest five-seater, five-door sedan on the road, and with the AWD launching some scintillating 0-100 km/h times the new M5 is absolutely sensational. On the road the new M5 has really great driver involvement that draws the driver-in to want more; more power, more acceleration and more excitement, and the car delivers it. You’ll be easing off well before finding the car’s true limits in the corners as the AWD grip is superb – one of the best experienced. BMW have also enabled the AWD to be switched to just RWD for those swanky drifts one can enjoy on a long rounded corner. These unbeatable driving dynamics with maximum directional stability was a goal set and met by the team that tuned the new M5 at BMW’s own race circuit at Miramas in the south of France. They also performed rigorous testing on the famous Nürburgring. The tyres fitted as standard on the 2018 BMW M5 sedan are 275/40 R 19 at the front and 285/40 R 19 at the rear. The rubber is mounted on five-double-spoke cast light-alloy wheels in polished Orbit Grey. As an option, you can add more visual impact by kitting the new M5 with 20-inch seven-double-spoke wheels in black or polished black. All wheels are ZR speed rated, which makes them suitable for travelling up to the car’s top speed of over 305 km/h. 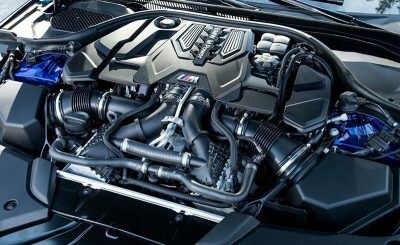 Thanks to the new BMW M5’s twin-turbo 4.4-litre V8 engine the M TwinPower Turbo technology packs a 441 kW output and a peak torque of 750 Nm. This hefty performance offers the driver supreme propulsive power and formidable performance. Launch control has the five-door sedan scampering through the 0-100 km/h dash in around 3.4 seconds or less. Quarter mile times are completed in around 10.9 seconds, while the car is factory fitted with a speed limiter at 250 km/h. This is the fastest M5 of all-time and definitely feels the most nimble too. AWD and automatic, in the new M5 everything gets done in instant precision. Each of the gearshifts are lightening quick and can be performed automatically or via the paddle shifters. Launch control allows the engine to be revved close to 3000 rpm before take-off, with a hint of wheel-spin controlled via the traction control on each individual wheel. Despite having the added bonus of AWD, the 2018 BMW M5 is almost 10 kg lighter than the outgoing model making it great fun in the corners. It’s a settled, refined car for the grown up ‘hoonigans’ among us. 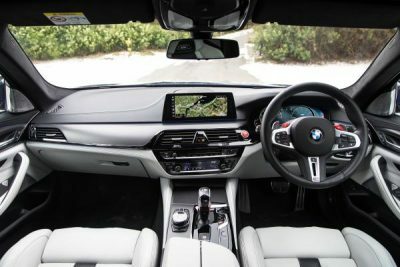 Sit yourself down in the new M5 cockpit, and the car still looks and feels very luxurious. Driver comfort is a clear priority, and the leather-upholstered seats do a superb job of offering supple and supportive ride comfort. When you get up to motorway speeds the 2018 BMW M5 remains hushed, relaxed and totally in-control. Even at 110 km/h the new M5 has only 66 decibels of noise registering in the cabin. Get the twin-turbo V8 acceleration on full power at 110 km/h and the noise is glorious but only registering 74 decibels. There is a selection of driver modes, and when Sport mode is selected, an enhanced soundtrack of the engine at 80 decibels is played through the audio system for a totally spine-tingling experience. Rear seat occupants are cosseted in fine leather-sport seats that also offer excellent comfort and support. Three three-point seat belts are available for the rear seat passenger space. As far as a long-legged tourer goes the new BMW M5 has to be one of the best and most inspiring drives out there, and even Mercedes AMG and Audi RS equivalents will need to up their game to match the new M5 for such an enjoyable, complete driving experience. A large digital instrument cluster from the BMW 5-Series has an M-specific cluster design and keeps the driver informed on the driving dynamic mode, M xDrive all-wheel-drive system’s setting and Drivelogic option currently engaged. Key elements here for the sporty driver are the variable rpm pre-warning field and shift lights that show the best time to change gears when in manual shift mode. This data can also be reflected into the BMW M-specific Head-Up Display, which is both clear and distinctive. The 2018 BMW M5 is upholstered with Merino leather as standard – though there are a variety of leather seat options and colours available. The driver and front passenger settle down into M sports seats with electric adjustment, seat heating and an embossed M logo in the head restraints. They also enjoy electronic adjustment for the seat depth and pneumatic backrest width adjustment to deliver optimum lateral support. M multifunction seats are also available as an option, and these seats boast integral head restraints providing even better support in the shoulder area, an illuminated M5 logo and extended functions. With their racing-style bucket shape and the thicker side bolsters of the seat surface and backrest, the M multifunction seats offer even greater lateral support and some even sexier looks. A huge step forward, in my book, sees BMW provide the new M5 with all the driver assistance systems and features familiar from the new BMW 5-Series – including the excellent multifunction touch screen in the centre of the dash. The new 2018 BMW M5 can be ordered in a variety of exterior colours, and one of the really impressive shades, I reckon, is the Marina Bay Blue Metallic in all its intensity. There are some Matt finishes such as Frozen Dark Silver and Frozen Arctic Grey that can be specified as an option on purchase. If you like, you can opt for an exclusive aluminium trim with a carbon-structure that provides a special sporting embellishment over the standard trim. 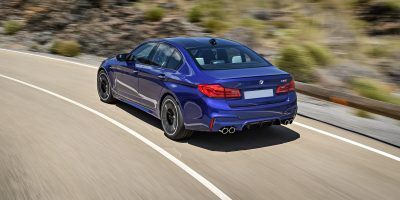 The exciting new ultimate sports sedan from BMW does know how to dance, and with its long and lengthy M5 lineage this 2018 M5 is a special trump card for the brand. Awesome! For any more information on the 2018 BMW M5 or, for that matter, any other new car, contact one of our friendly consultants on 1300 303 181. If you’d like some fleet discount pricing (yes even for private buyers! ), we can submit vehicle quote requests out to our national network of BMW dealers and come back with pricing within 24 hours. Private Fleet – car buying made easy!